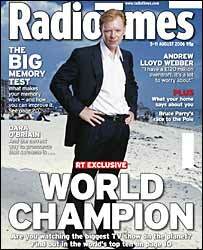 The programme – starring David Caruso – made the top 10 viewing charts in more of those nations than any other show. Lost and Desperate Housewives were at numbers two and three, followed by Colombian soap Te Voy a Ensenar a Querer, or I Will Teach You to Love. The survey, which was conducted by Informa Telecoms and Media, has been published by Radio Times magazine. The executive producer of CSI: Miami – broadcast on CBS in the US and Five in the UK – has two more shows in the top 10. Jerry Bruckheimer’s original CSI, set in Las Vegas, at number six and missing persons drama Without a Trace in seventh place. Te Voy a Ensenar a Querer – telling the story of a father and son who are both in love with the same woman – is one of three Spanish language titles included in the survey. 9. Anita, No Te Rajes! At number eight is Inocente de Ti, which translates as Innocent of You and is the third remake of 1970s Mexican soap Rina, according to Radio Times. It follows two sisters as they take their grandmother from Mexico to Miami to find their alcoholic father. Anita, No Te Rajes! – or Anita, Don’t Give Up! – makes ninth place in the survey. It was funded partially by American network NBC as a way of creating programming for the growing Hispanic population in the US. There is only one children’s programme in the top 10 – The Adventures of Jimmy Neutron: Boy Genius, which is made by Nickleodeon, at number 10. “The objective of our research was to find the most consistently successful programme worldwide in terms of attracting viewers,” said Adam Thomas, the media research manager responsible for the study. “We were not therefore concerned with shows that performed extremely well in a relatively small number of markets. “CSI: Miami was therefore named the most popular programme because it featured in more country top 10 rankings for 2005 than any other,” he told the BBC News website.